The glowing Gothic beauty of Notre Dame cathedral at night was my first real exposure to Paris. My flight in was delayed and the city lights were on by the time I got off the Metro and found my way to the Paris landmark you see in this print. Seeing a city for the first time after dark isn’t my normal way of traveling, but Paris is exceptionally pretty at night. In fact, the illumination of Notre Dame cathedral at night reminded me of a great shining star in the Paris night, hence the name of this print. Notre Dame Cathedral at night was such a story of illumination that I feel like this artwork is literally a depiction of light flooding the darkness. Just look at the shadows and darkness at the edges of this print and the light radiating from the mass of architecture in the middle of it. The light is essentially tracing the subjects of the image out of the Paris night. Aside from the glorious illumination, my favorite element of this Notre Dame Cathedral at night print is the little cluster of girls in the foreground. They’re clearly in their own little world at the periphery of the light. Instead of looking up at the glowing Gothic architecture, they’re engrossed in… a conversation about where they are going for dinner? A private joke between friends? Are they locals who just stopped here on their way somewhere and it’s simply another night in Paris to them? It’s a story up to you the viewer of this print to guess. But they are ultimately the humanizing element I was looking for when I was composing this scene. Seeing Notre Dame Cathedral at night was an amazing start to my stay in picturesque Paris and this winter scene is still one of my favorites. It was a full month after Christmas but there’s still a lighted tree in the square before the old church. Perhaps it’s more a winter thing than a Christmas thing in France? I’m not sure but that twinkling tree at the foot of the cathedral added to the star-like feel of the old church. 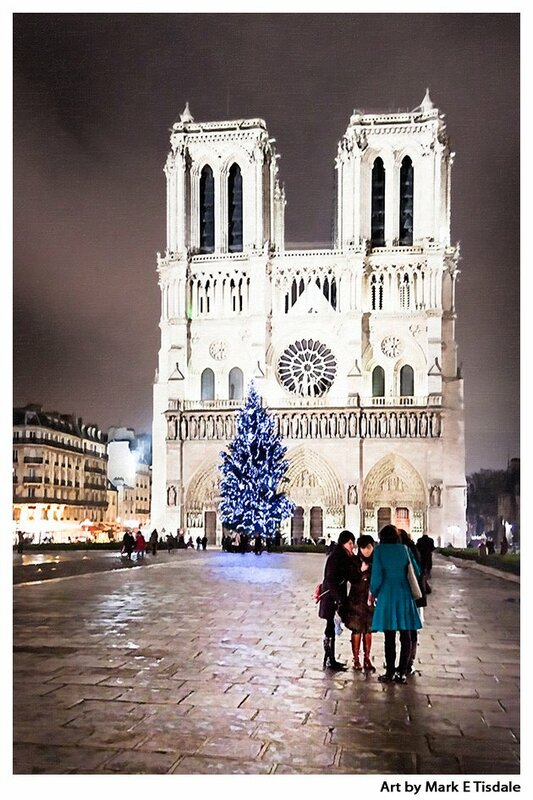 Have you stood in the square in front of Notre Dame Cathedral at night in Paris? Were you as amazed by the illumination as I was? Or perhaps you dream of going some day and are simply mesmerized by this bold print? I hope you might pause for a second to let me know your favorite part of this Paris after dark print!